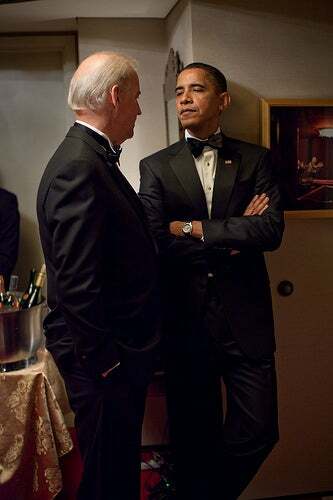 Is President Obama Giving Joe Biden the Side Eye? The answer to that question really depends on whom you ask. In fact, the raising of that questions depends upon how much we care to make mountains out of mole hills. Glenn Reynolds of Instapundit has apparently never seen a mountain he didn't like. He says it's no fluke; that there's something behind the president's look, something other than just kinda standing and shooting the breeze. Considering the amount of photos taken daily of the president, you might think that perhaps this was just one of those not-terribly-good photos we've all had snapped of us mid-conversation or while shoveling lasagna in our mouths. Andrew Sullivan of the Atlantic thinks Reynolds' mountain-making is yet another example of the political gold borne of race-baiting. The Buzz thinks the best commentary comes from Mike Potemra of National Review who looks at the photo, shrugs in about a hundred words and goes on with the rest of his life.